Home Things To Do	Have you been to Disney in the last year? Have you been to Disney in the last year? Well, there are lots of updates and some pretty exciting improvements. It’s about that time of year again when my phone starts ringing for Christmas and Spring Break plans at the Magic Kingdom. This year in particular, there are some new fun things to talk about. Fantasyland has been the largest expansion in Magic Kingdom Park history. It provides a new home for Ariel, a new way to meet Belle, delicious dining and a double dose of Dumbo. The last addition of the Seven Dwarf’s mine train is scheduled to open in early 2014. My family visited in July, only the hottest time of the year to visit, and in our case the wettest. It rained on us every single day but my kids still loved it. The highlight of Fantasyland by far was Enchanted Tales with Belle. It had a pretty lengthy wait but we were up for it, mainly because the line was in a dry spot. They only allow a few adults and children into the experience at a time. It is a little mini play. All the children who wish to participate are chosen for parts and act out the play with Belle, live and in person. My 5 year old son Jackson was chosen as the Beast and my daughter was Mrs. Potts, perfect for the girl who wants to play tea party every day. I have to say it was adorable and a Must do if you have a Belle fan. 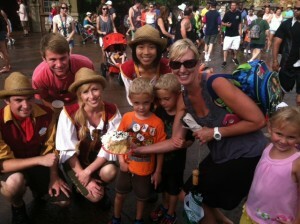 After we had survived one ugly downpour, we were strolling towards Gaston’s Tavern. Gaston is usually on hand to sign autographs and take pictures but with the rain his visit was cancelled. We were just casually discussing the fact that maybe we would be able to see him next time since he wasn’t available, when of nowhere, 3 employees presented our family with a Huge warm cinnamon roll as a condolence for missing Gaston. It was so good but I was more impressed with the fact that they were so kind to total strangers completely unsolicited. 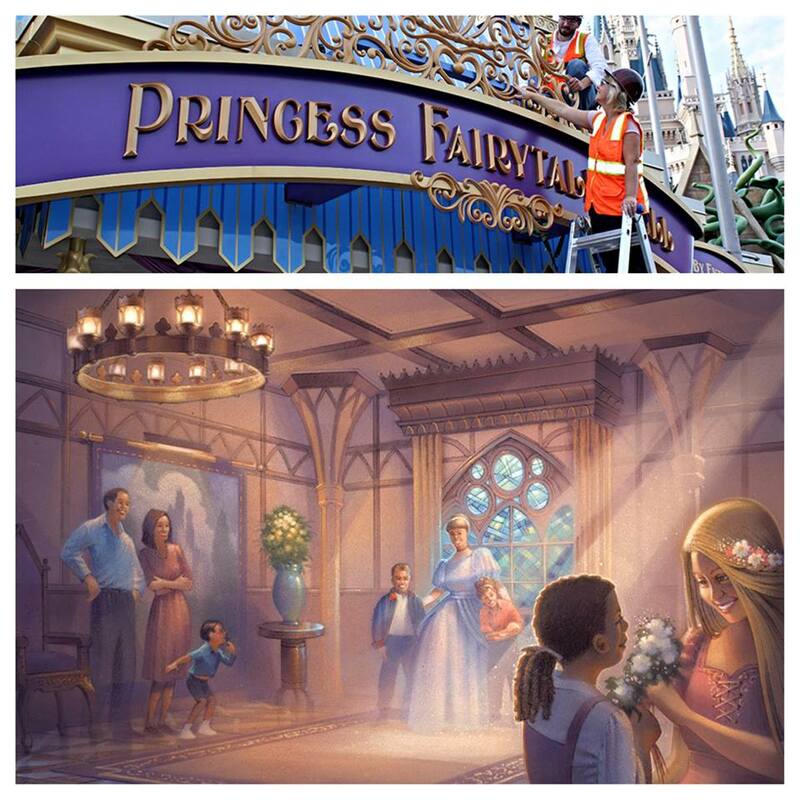 Another addition is the princess fairytale hall. The marquee has just been unveiled and will house a choice of a meeting with Cinderella or Rapunzel and each will have a princess friend. This will most likely include a fast pass option. 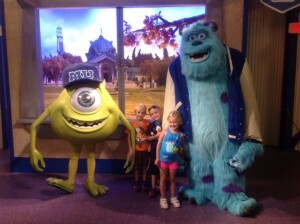 If your kids love Disney Junior check out Hollywood Studios. They have added a couple of new characters. Sophia the first and Doc McStuffins are a big deal at my house. They also have tons of activities that include the characters from Monsters University. The biggest upcoming surprise is the addition of My Magic +. It is in the beta test phase now but will be a really cool new way to travel around the park. It is a wrist band that not only gives you park entrance, track your meal plan, fast passes, access to select attractions but even designated viewing areas for shows and parades. You will even have access to character meet and greets before you leave home. The initial users will be guests of Disney resort properties but eventually may be open to any guest. I also used the My Disney Experience app, which was free, on our last visit and it was amazing. It gave us wait times for rides in real time as well as fast pass times. It allowed us to change our plans based on the wait time without actually walking across the park to that attraction. It also gave you the list of characters, times and their locations for the day. I have to give a shout out to our weather app too, it saved us from getting drenched many times. It is called Dark Sky and gave me about 3 minutes notice before it started to rain. I still use it. It was $3.99 on my smart phone. There is always something happening at Disney but this has been a pretty busy year with updates and upgrades. On another exciting note: Allegiant Air is opening service from Concord to Orlando. They have very inexpensive rates if you can catch them just right. Epcot International Food & Wine Festival is September 27-November 11th. Free Dining Plan must be booked by September 15th for stays at a Disney Resort property through the end of the year for specific dates with a 6 night stay. Up to 30% off at select Disney Resort Properties also through the end of the year. Available most dates and must be booked by November 3rd. Cruise rates out of Miami starting at $99 per person, per night for nights from October 27-November 15. These rooms will sell out very quickly. If you have any questions about these or any other travel opportunities please call or email me. I am happy to help. Any Smarty Moms on the beta test list? Swim Team Must-Have: Poolotz, Offering Exclusive CSP Discount! Great post! My husband and I went five years ago and now we have a little girl and a boy on the way – we can’t wait until they’re just a little bit older to whisk them away to Disneyworld! The My Magic + sounds amazing!! We went in August and stayed at the Contemporary, which is one of the resorts testing the Magic Bands. They were amazing and even if you have been to Disney recently, they will make your next trip that much more magical with the extra flexibility they offer.